What could be better than sipping a Viennese coffee with a slice of cake while you watch the world go past (literally)? Coffee with a view is a remarkably accurate description of the Donauturm. 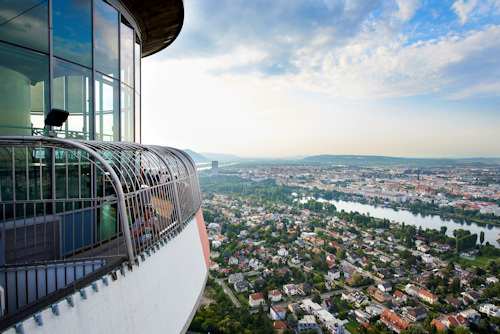 It’s Austria’s tallest building and a purpose-built viewing tower that looks out across the city and the Danube river. Express lifts take you up over 150m to the split-level viewing platform, which offers a 360° view across the entire city and beyond, with both open-air and under-glass viewing options. Tip: Look up when in the lift – the ceiling is glass. The floor isn’t (fortunately). Interactive multilingual touchscreens let you zoom in and learn more about individual buildings and what it is you’re actually looking at. Tip: Here are some more places offering a good view of the city. 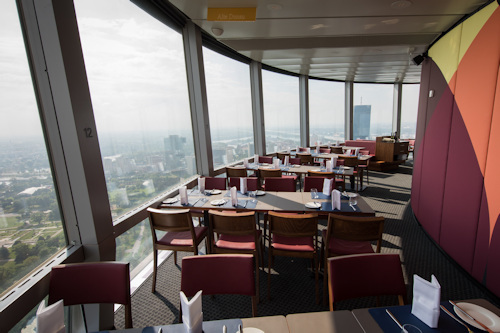 The viewing area might not even be the best bit, because there’s a coffee house above the viewing platform and a restaurant even higher up (170m). Both venues open late and both revolve, taking around 24 minutes to do a full turn – certainly long enough for a cappuccino. The entire facade moves, so the window turns with you and your view is always clear. The tower was completely refurbished in 2018, so the decor is pristine while retaining its classic and simple 60s look and feel. On the culinary front, the offerings are what you might call a celebration of Vienna and its environs, with local, traditional and seasonal specialities, wines from the region, etc. The prices aren’t cheap, but that’s understandable given the logistical difficulties involved. I had no time to stop, but the thought of a relaxing beer in the coffee house, watching the anthill of activity below, was one I’ll turn to reality sometime soon. If you do want to eat at the restaurant, it makes sense to book (especially for later in the day). Booking is also required for weekend and holiday brunches at the coffee house and for special packages, such as “Full Moon Night” or the “Lover’s Dinner”. As you can imagine, some of these “specials” sell out well in advance (cough…New Year’s Eve…cough). So plan ahead. And if that’s not enough choice, there’s also a coffee house and pub-restaurant on the ground floor, too. At the time of writing, the tower is open from 10am to midnight, with the last elevator going up at 11.30pm. Entrance costs €14.50 for adults, with the usual concessions for kids and seniors. The Vienna Pass (see a review) gets you up the tower for free and you can also buy advanced tickets*. Lockers are available in the ground floor ticket office. I visited during the day, but I imagine Vienna by night on a clear evening is quite a spectacular view. If you have time, enjoy the park around the tower, too. The “Donaupark” has sculpted gardens rich in bees and butterflies, water features, a miniature railway, small sculptures, and grassy meadows particularly well-suited to tiring out kids. Check your accessibility needs before visiting. This is a listed building so it’s not possible to adapt it to all accessibility requirements. The lifts take you to the viewing platform and a central level with toilets, but there are short flights of stairs to the restaurant and coffee house. Prams and buggies are not allowed up the tower for safety reasons. Do check the official website for the latest information. Once at either subway station, catch the 20A bus line (or take the tower’s own free shuttle bus service) to the Donauturm. For obvious reasons, it’s easy to spot the tower from afar. 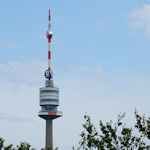 If you’re up for a 20 minute walk, go to the Alte Donau station and wander northwest along Arbeiterstrandbadstraße, then through the Donaupark (Danube Park) to the tower.